What Is the LAODICEAN CHURCH? When should we expect the Laodicean condition in the Church of God? Who are to be a part of it? SEVERAL church denominations claim that they are now in the Laodicean era — that the many churches of THIS WORLD are a PART of that Church described in Revelation 3:14-22. A few claim that we, the Church of God, are the Laodicean Church because, as one person has stated, we do not have the gift of "unknown tongues!" Others say the Laodicean era of the Church will occur in the Millennium. But notice! During the Millennium, God will use the KINGDOM OF GOD as His instrument on this earth, and not merely a fleshly Church. Therefore, the Laodicean era of the Church cannot be during the one thousand year period! The seven Church ages of Revelation 2 and 3 lead up to the coming of Christ. The Millennium follows the ages of these seven Churches. We must expect this period before the soon return of Jesus Christ. The time is short! The Laodicean era is either here now, or it must come quickly and last but a short time! Is it possible for two entirely separate works, or two separate organizations of God's Church to exist at the same time as Jesus' instrument in preaching to the world? Was the New Testament Church in Paul's time two separate organizations? No, the Church was not split! The Church was ONE. God does not have two organizations CARRYING OUT HIS WORK OF PREACHING THE GOSPEL TO THE WORLD at one time. The Church is not a divided work competing with itself. Christ's own words were, "And now I am no more in the world, but these are in the world, and I come to thee. Holy Father, keep through thine own name" — The Church of God — "those whom thou hast given me, THAT THEY MAY BE ONE, as we are" (John 17:11). Notice, "that they may be ONE" — not divided, not split in two organizations. If the Church of Laodicea and the Church of Philadelphia are separate bodies — both doing the same work of God at the same time, this prayer of Jesus was in vain! What happens to member of God's Church if they commit apostasy, or if some split off as another group? They would no longer be a part of the Church of God! There are several examples of groups who have split themselves off from the true vine. We have the two recent examples of the "Seventh Day Baptists," who have taken themselves out of the name of the Church of God, and the "Seventh Day Adventists" who have done the same. They do not even call themselves the "Church of God" anymore — because THEY ARE NOT GOD'S CHURCH! But what about the "Sardis Era" of God's Church? Are they not existing at the same time as the Philadelphia Era" of the Church? Yes, but notice their condition in Revelation 3:1. "And unto the angel of the Church in Sardis write: These things saith he that hath the seven spirits of God, and the seven stars; I know thy works, that thou hast a name that thou livest, AND ART DEAD!" They have the name of the Church of God, and yet THEY ARE DEAD. Today the small divided remnants of that Church are spiritually dead. They are not now God's instrument for carrying out His work. They are just a few scattered people not a living organization carrying on God's work! Since 1934, at the beginning of the Philadelphia Era, this work has taken the place of the dead Sardis Church. Since that time the Sardis Church has not been doing the work of spreading the gospel to the world as a witness! Let us take another example. If a part of the Church today would go off into error and establish its own Church, that body would be rejecting the authority that God has set in the Church (Eph. 4:11). An example of such rejection is found in I Samuel 8:7. The Church of Laodicea would NOT be such a split from the Philadelphia Church! Such a split WOULD NO LONGER BE A PART OF THE CHURCH OF GOD! All these scriptures show us that the Church of God is not a divided or a split Church! Let's examine some of the facts about the Church of Laodicea" Read Revelation 3:14-22. Notice verse 15. "I know thy works, that thou are neither cold nor hot." Here is the first indication about this Church — they are lukewarm! Verse 19 tells them to "be zealous." Because they do not have zeal, Christ will "spue them out of His mouth." It claims that it is spiritually rich and increased with goods, and has need of nothing. We can apply this to physical things; however, the Bible makes it plain that the condition is primarily spiritual! This Church believes it has knowledge, understanding, spiritual goods, righteousness, and many other attributes to commend it to God. Instead of that, Christ says, "You are wretched and miserable and poor, and blind, and naked!" This Church is then told: "Buy of me gold tried in the fire, that thou mayest be rich." Notice that this particular Church should buy gold tried in the fire. What does it mean to have "gold tried in the fire?" Turn first to Malachi 3:2-3. "But who may abide the day of his coming? And who shall stand when he appeareth? For he is LIKE A REFINER'S FIRE and like fuller's soap; and he shall sit as a refiner and purifier of silver, THAT THEY MAY OFFER UNTO THE LORD AN OFFERING IN RIGHTEOUSNESS." These people are to be tried in the fire, purified and purged. They are punished, and tried in persecution and tribulation! Next turn to Zechariah 13:7. "Awake, O sword, against MY SHEPHERD, and against the MAN that is my fellow, saith the Lord of hosts: smite THE SHEPHERD, and the sheep shall be scattered: and I will turn mine hand upon the little ones." In Matthew 26:31, we find that this refers specifically to Jesus Christ. But prophecies are often dual in meaning. This verse can also refer to a leader in the Church of Laodicea. He — the shepherd — is killed as a result of the persecution against the Church of Laodicea. The sheep, or the remnant of that Church (Rev. 12:17), are to be scattered through war. When does this happen? Just before the coming of Jesus Christ! At the time that SHEPHERD is going to be killed and the sheep scattered, the third part of the nation Israel (Ezek. 5:12) is going to be brought through the fire — and the Church of Laodicea will have to go through it! A time is coming when what is left of that Church is going to be scattered, persecuted and hunted, killed by the "fire" of men. AFTER this severe trial, they will zealously call upon God and He will hear them, and say "It is my people." The "Laodiceans" are also told to "get white raiment," typical of righteousness and purity. That is obtained by OVERCOMING the severe trials and tests that they will face (Rev. 3:5). These people cannot see their spiritual wretchedness. They are told to anoint their eyes with eyesalve so that they may see. Are some of you in this same condition, where you cannot see yourselves as you should? Are you zealous, or are you like people who are neither cold nor hot? We must have this zeal, or we may find ourselves in the Church of Laodicea! "Let him that hath an ear hear what the Spirit saith unto the Churches." The next thing commanded the Laodicean Era is to repent (verse 19). God's people need a repentant attitude at all times. Since these people are told to repent, they are not in such a repentant attitude! And yet, they are the Church of God! They keep God's commandments (Rev. 12:17), keep the Sabbath, obey God's laws, and yet they have no zeal and they are not fully repentant! They do not change when they receive correction. Does this describe any of us? Remember individuals and local congregations may at any time be like any of these seven Churches. They all existed locally in the apostolic age! Read the parable of the ten virgins (Mat. 25:1-13). Notice the condition of those who are begotten into the "Kingdom of heaven" at that time (Mat. 25:1-2). Observe the similarities between the "Church of Laodicea" and the ten virgins who "ALL slumbered and slept" (verse 5). All ten, though lacking in zeal and slumbering, are virgins and have not defiled themselves with the harlot of Rome or her daughters (Rev. 14:4). Five, however, were wise enough to repent in time and be imbued with the Spirit of God. But there are certain things wrong with the other five of them. The five foolish took no extra oil with them. There was no repentance — no change. Their lamps were GOING out. (The King James Version inaccurately reads "GONE out." See the Greek text or any modern translation.) Oil is typical of the Holy Spirit of God and they did not have enough of this Spirit. They did NOT realize this most important need until the cry went forth to go out to meet the bridegroom! The foolish virgins then went to buy oil. But it was too late! The door was closed for them. They were not admitted into the marriage. The lesson here is that the remnant Church must always watch, for it does not know the day nor the hour that Christ will return! Let's compare this parable and the Church of Laodicea with the Church of Philadelphia. We have proved through history and through God's Word that this work, the Radio Church of God, is the "Philadelphia Era" of the Church. Notice now the differences. Revelation 3:7-13: "And to the angel of the Church in Philadelphia write these things saith he that is holy, he that is true, he that hath the key of David, he that OPENETH, and no man SHUTTETH; and SHUTTETH and no man openeth." 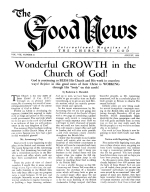 The great door that God has opened to this work is the facility to go into all the world and preach the gospel; the door of radio, the door of the printing press, plus many other such doors. God has set before us an open door and no MAN can shut it. God can shut it, and He will when the work is finished and the Philadelphia Church goes to a place of safety. "I know thy works: Behold, I have set before thee an open door, and no man can shut it: for thou hast a little strength, and hast kept my word, and hast not denied my name" (verse 8). Notice that this Church has works. It has works of ZEAL and of REPENTANCE. This Church has only a little strength. Let's bring it down to the individual level even though it is referring primarily to the Church as a whole. Most of us as individuals realize how little strength we really have, how we lack in some of the spiritual gifts. God has given the Church a good measure of wisdom and of knowledge and faith. He has given us many other gifts but we still lack in many things, but we also realize it. Our Church has not denied the name of God. THIS Church is going to be protected from the hour of temptation, or of trial and tribulation which will come upon all the world (Rev. 3:16). But the Church of Laodicea must go through severe tribulation. The Church of Laodicea is to be lukewarm, lacking in zeal and repentance. They were lacking in God's Spirit. Because of this, Christ said that He would spue them out — they would no longer have His protection. They thought they were rich, just as the foolish virgins, in the parable, thought they had plenty of oil. After it was too late, they learned that their supply of oil was gone! There is a door in each case, closed! Christ says that He knocks at the door of the Laodiceans. The foolish virgins among them left the door closed! The Philadelphians will be taken to a place of safety for three and one half years (Rev. 12:14). And yet, there is a remnant of the Church which remains and who will not be in that place of safety (Rev. 12:17). This remnant which remains IS a part of the Church of God, and keeps the commandments of God. It is the Church of Laodicea who had no vital part in the work of God today EVEN THOUGH THEY LIVE TODAY AND ARE A PART OF THAT GENERATION WHICH WILL SEE CHRIST RETURN. Jesus Christ instructs all of us to watch and pray always that we may be accounted worthy to escape all the things that are coming upon this world (Luke 21:36). Some will not be accounted worthy to escape these things. Those of the Church of Laodicea will find that they are not worthy to escape. The DOOR OF SAFETY will be shut for them. To those who still will not overcome, it will be closed forever! Others, who become faithful and overcome, not loving their lives unto death, may yet gain eternal life as the five wise virgins do. God's people have been warned time after time from the pulpit and in the pages of the PLAIN TRUTH and The GOOD NEWS that they must continue in a repentant attitude. Yet some still lack zeal, though exhorted to be zealous. Some are spiritually asleep, and have been exhorted to wake up. Any one of you can now be in the spiritual condition of Laodicea even though that age of the Church is yet to arise. Notice I Corinthians 3:11-15. Here we see those whose works are burnt up — WHO THEMSELVES MUST BE PURIFIED BY FIRE to be saved "at that day." Surely here is a picture of the Laodicean character! Let's be among those who realize that they have little strength, and have not denied the Name of Christ. They have kept His patience. They have kept His Word. They are striving hard, and are overcoming. Let's hold fast and maintain the identifying marks... Church of Philadelphia. Let's not be among those whom God will have to separate from His living Church today. The Laodicean Church is not going to he worthy to escape to a place of safety. When it is too late, they will find that the Church of Philadelphia has gone to safety. Only two choices remain for each person left. They will be tried by the fire of men, and may lose their lives in severe tortures; or if they recant, they will lose their lives in the final gehenna fire. In either case, they will be tried in the fire. If they are tried by the fire of men and still overcome, they will be given eternal life. If they fail this, the final GEHENNA FIRE with everlasting destruction will be their doom. Judging from the parable of the ten virgins, if you are found in the Church of Laodicea, YOU PROBABLY DON'T KNOW IT. You may think you are in the Church that will go to safety. When you find out it will be too late. Now is the time to prepare. Now is the time to be zealous. Now is the time for good works — the time to obtain more of the Holy Spirit of God. Now is the time to keep repentant, to change our lives. Let's not be a part of the Laodicean Church!